Back when it was just a flash game on PC it didn't SEEM like Trials was going to be a thing. It seemed like it was too simple. 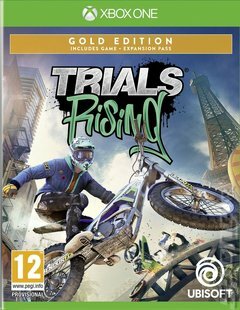 And yet... the incredibly 'easy to learn, difficult to master' blend of motorbike riding and platforming has always been too gripping and addictive to leave alone, and Ubisoft just keeps on taking it to new levels. For the uninitiated - in Trials you ride your bike across an extremely aggressive and lethal trials stunt course. All you control is the acceleration and the braking. That's it. No steering, because you're on rails. Just tweak the analogue sticks to control you're speed and traction and you're good. Sounds simple, right? Wrong. The game serves up some of the most challenging, frustrating and rewarding gameplay going. The feelings of defeat when you hit a particularly challenging obstacle could drive you to punch holes in walls, but the elation that comes with conquering said obstacle is IMMENSE. Trials Rising is the most full-bodied offering in the series to date. It brings the action back from the future of Trials Fusion to the present, with courses laid out around famous landmarks like Mount Everest and a theme park that for legal reasons is definitely NOT Disneyland. Said locations include more detail than ever, as well as a set of stadiums for you to be humiliated in. Likewise, the level editor returns to further build out the masses of content available. Perhaps the most fun/infuriating addition, however, has to be the inclusion of tandem riding for you and a pal. One of you controls the acceleration, one of you the braking. What could possibly go wrong with your friendship?